In the case of higher plants and algae, the OEC is found integrally embedded within the thylakoid membranes, located within cytoplasmic organelle's known as chloroplasts. Cyanobacteria have no internal organelles, and therefore no chloroplasts, and the OEC is found within thylakoid membranes distributed throughout the cytoplasm. The Cyanobacteria are quite small, and are about the same size as the internal chloroplasts of eukaryotic plants and algae. Size is one branch of evidence which supports the theory that chloroplasts are ancient Cyanobacteria (many other facts exists which also support this theory (circular DNA, bacterial ribosomes, et al.)). To review the components of PSII, click on the image at left to explode the details of the PSII reaction center. (Image at left from Science Beat, an on-line science newsletter published at Berkeley University (2)). There are two photosystems, PSII and PSI, which communicate with one another via an electron transport chain known as the "Z scheme" of photosynthesis. Electrons are initially extracted from water, one at a time (1 photo per electron) at the site of the OEC, and finally released to a soluble ferredoxin complex after passing through PSI (where it is further re-energized by a second photon). Ferredoxin then reduces Fd-NADP oxidoreductase, which reduces oxidized NADP, which then reduces 1,3-bisphosphoglycerate. This latter reduction step regenerates Ribulose-5-phosphate followed by incorporation of CO2 by Ribulose-bisphosphate carboxylase (Rubisco) - the most abundant protein on the planet. The reduction of CO2 (carbon fixation) is known as the "dark reaction" of photosynthesis, or the Calvin Cycle (sugar production). In algae and plants the thylakoid membranes are found partially stacked (grana) where PSII occurs in higher concentration than PSI (the stacking of the thylakoids may be related to an increase in the photon transfer efficiency of surrounding light harvesting chlorophyll complexes (LHCP) between reaction centers. Note in the pop-up window of the light harvesting complexes the concentric arrangement of the two classes of light-havesting proteins. The innter concentric ring are the primary LHCPs (LHI), the outer are considered secondary (LHII). Both are under strict energetic control and may be concentrated around either Photosystem I or II. These LHCP contain primarily chlorophyll and carotenoids. Recently the three dimensional atomic structure of the manganese-calcium oxide complex was determined by X-Ray diffraction. (3) The manganese cluster is essentially an inorganic cubane (cubical) structure found in crystals of ranciéite or hollandite [Mn4CaO9*3H2O]. These minerals are believed to have been assimilated during the early Archaean period by the Cyanobacteria approximately 3,200 - 2,800 million years ago (or 3.2 - 2.8 Ga=giga years ago). The assimilation of the manganese-calcium oxide complex by the Cyanobacteria is one of several examples of inorganic complexes assimilated by early life for enzymatic catalytic purposes. Two other inorganic metallo complexes assimilated by early prokaryotes (and are now ubiquitous redox centers in living systems) include the cubic iron-sulfur centers [Fe4-S4] [image] (originating as greigite ([Fe4S4][SFeS]2) (4), such as ferredoxin, and the nickel-iron centers [NiFe] [image], such as Hydrogenases. The successful assimilation of the OEC by early Cyanobacteria resulted in an explosion of this group which became the predominant life form for 2 billion years. Unlike other photosynthetic bacteria (discussed briefly below) the Cyanobacteria are "oxygenic photosynthesizers" capable of oxidizing water as a substitute for other electron donors such as H2S and reduced metals (Fe(II) e.g. 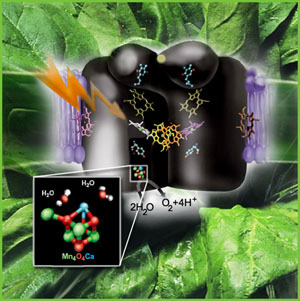 ), producing molecular oxygen as a by-product. Oxygen irreversibly changed the course of life on earth by releasing O2 gas in great quantities (changing, for example, the composition of the atmosphere as well as earth's geology). During this time the Cyanobacteria successfully dispersed globally and diversified through evolutionary speciation. (5) Finally, member(s) of the Cyanobacteria symbiotically merged with eukaryotes at about 2.0 Ga to become the chloroplast of all algae and higher plant groups on the earth today. The arrival of the OEC of PSII resulted in the most profound energetic impact on the history of evolution (unlimited electron source and energy source, q.v., water and sunlight). Indeed, the OEC is single-handedly responsible the rise of all plants and animals on the earth today.